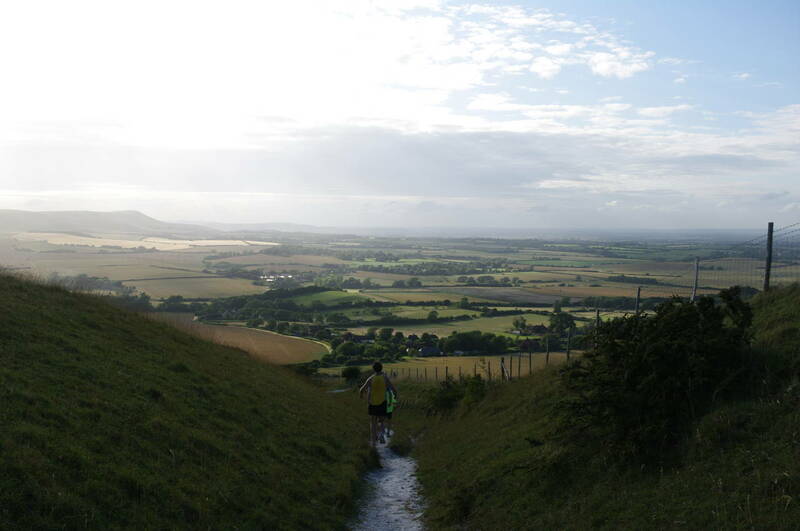 The eastern end of the South Downs Way has two alternative routes between Eastbourne and the village of Alfriston: a 16.9km coastal footpath and an 11.9km inland bridleway. 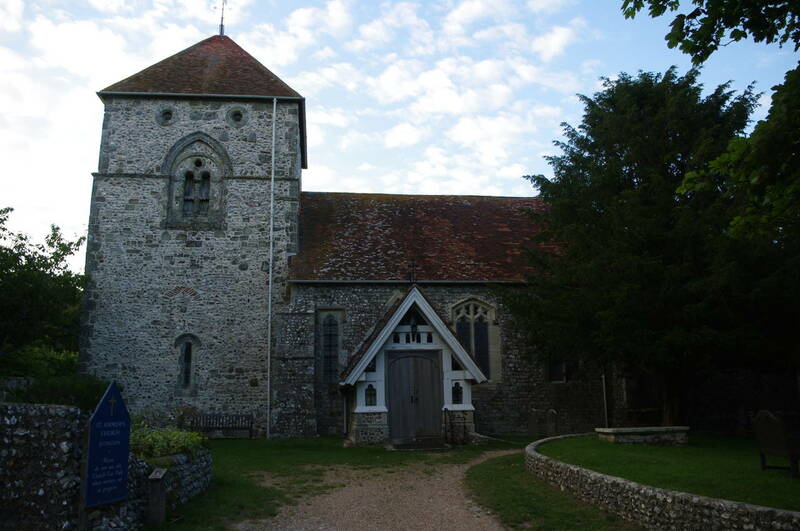 To make one (almost) continuous path, I decided to start the walk in Alfriston, following the inland route to Eastbourne and then taking the coastal route west. 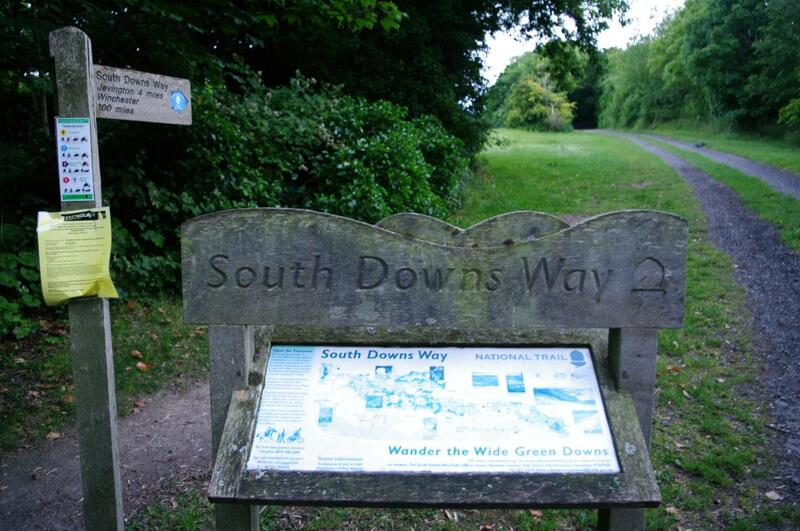 I started this short stage of the South Downs Way quite late in the afternoon, having spent the morning with friends in London watching the year's biggest Rugby League match live from Australia. Being from the great state of Queensland, I was very pleased to have seen my team run away with a sixth consecutive State of Origin series victory, while my friends were less pleased, as they are originally from south of the Queensland border, in the almost as great state of New South Wales. 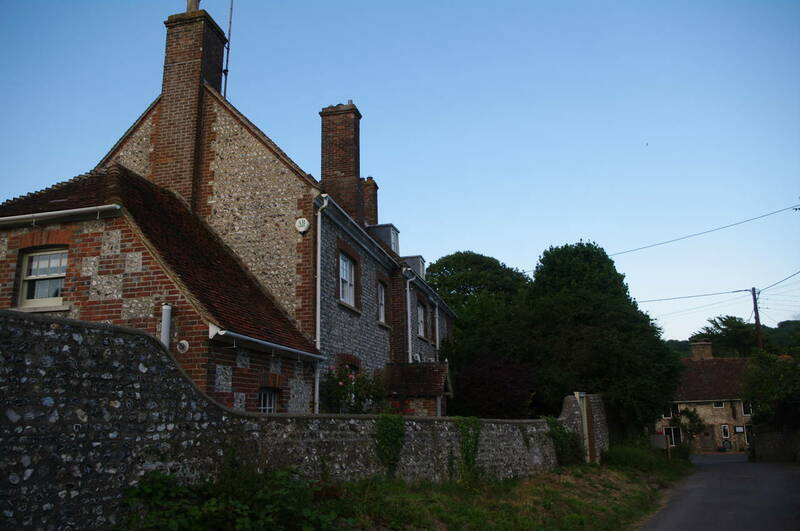 Heading back to Eastbourne by train and then to Alfriston by bus, I arrived at about 4:30pm. with a little more than four hours of daylight left -- plenty of time to reach the end of the walk on the edge of Eastbourne before dark. 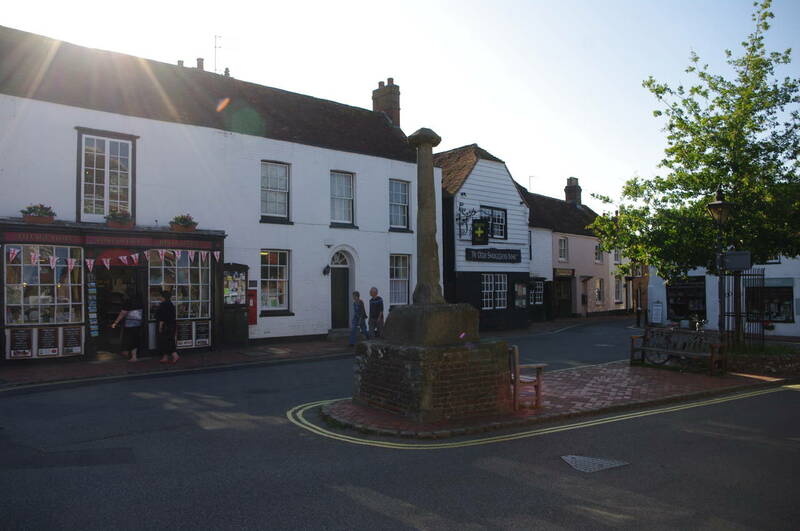 I started the walk in Afriston's small Waterloo Square (picture 1), just outside the village store where I had stopped to buy some superb locally-made sweets. The South Downs Way first heads east along River Lane, soon reaching the banks of the River Cuckmere, where the path turns right and approaches a footbridge that crosses the small river (picture 2). 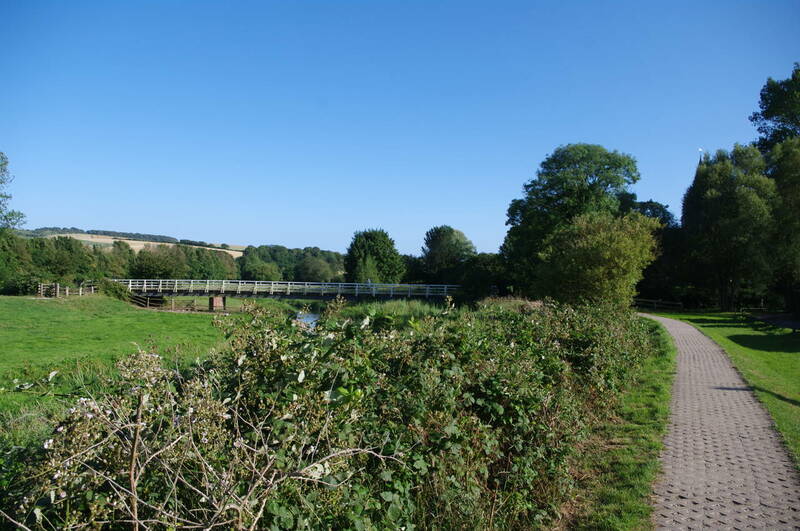 After crossing the footbridge, the coastal route turns right and follows the riverbank south, while the inland route continues ahead for a short distance to cross another, smaller footbridge and turn left just before the stone Great Meadow Barn (picture 3). 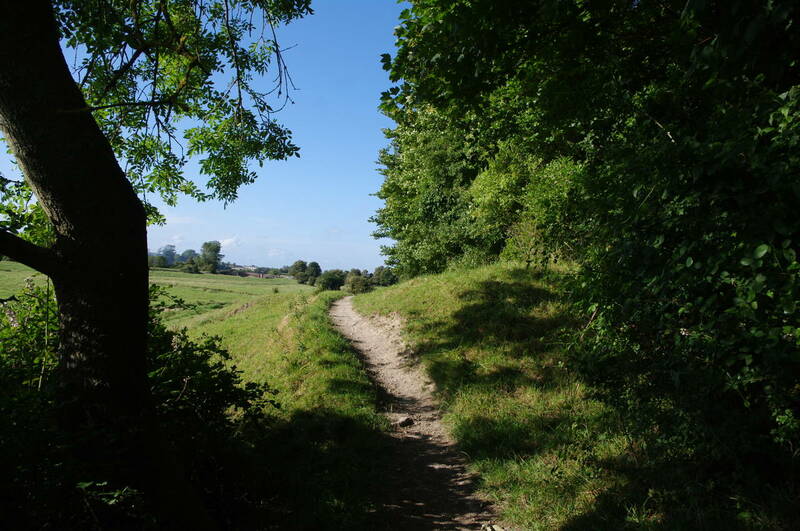 The path then runs northwards, just above the edge of the floodplain of the river (picture 4), for about 500 metres to reach a wooden gate at an intersection of quiet lanes. From the intersection, the route heads southeast, following a narrow lane as it steadily climbs through a belt of trees. Emerging above the trees, the sunken bridleway crosses another track and continues to climb up Windover Hill (picture 5). 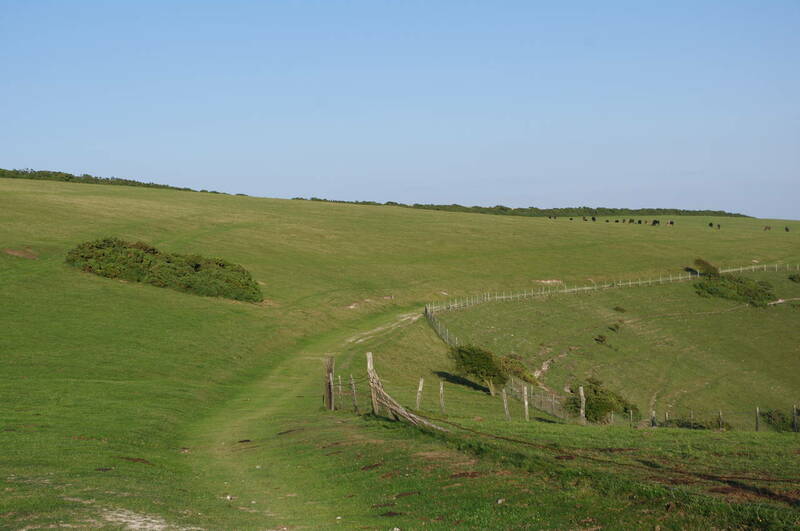 Climbing higher, there are some good views into a deep, grassy combe on the right of the path (picture 6) and across the Cuckmere Valley to the left. Just after the path begins to curve to the right around the end of the combe, another path merges in from the left. 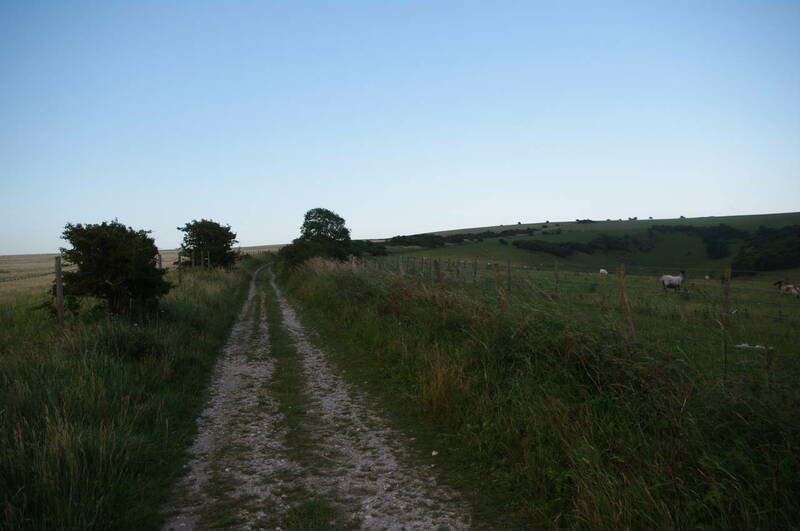 From this point, the mysterious chalk figure of the Long Man of Wilmington is only a couple of hundred metres ahead on the north-facing side of the hill, but the figure cannot be easily seen from above so I left the main bridleway and followed the other path, which descends steeply downhill with the small village of Milton Street visible ahead. Part of the way down the hill, I stepped off the narrow path to allow a group of joggers to pass as they ran down the steep slope at a rather dangerous pace (picture 7). 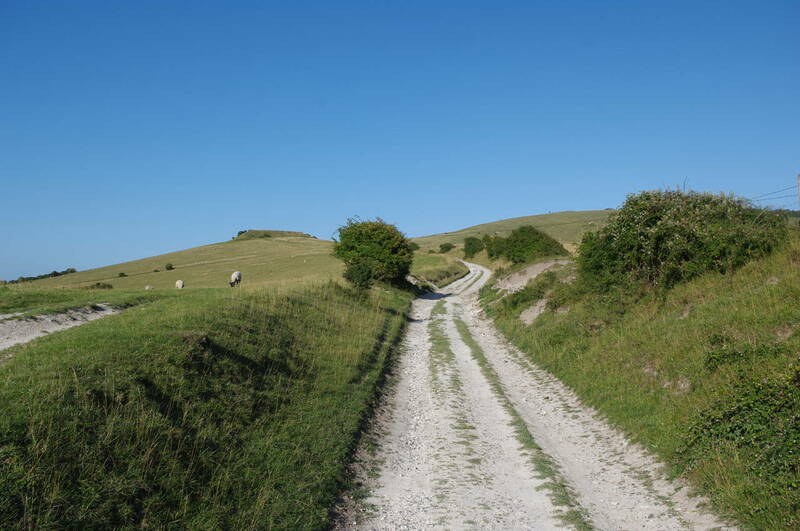 The path soon reached a minor road, which I followed to the right for about 500 metres until the Long Man came into view on the hillside across a field. A little further on a footpath led across the field and then along the face of the hill below the seventy-metre high figure (picture 8). 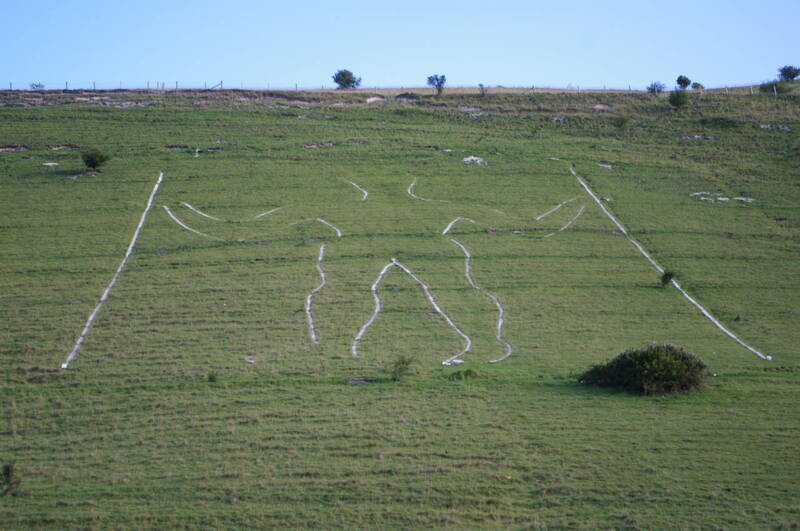 Nobody knows how old the figure is, what it's purpose might have been, or whether it was originally a male or female figure, One thing that is known is that the Long Man is the largest human figure in Britain. 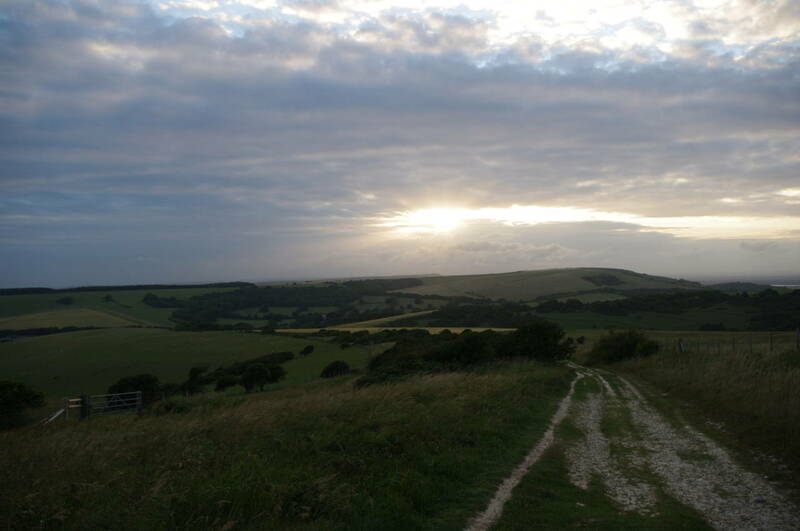 Continuing along the footpath, I soon returned to the point where I had left the South Downs Way on Windover Hill. The bridleway curves to the right around the end of the combe and then to the left, passing by some neolithic earthworks on the top of the hill. After passing through a wooden gate, the path becomes less distinct as it curves back to the right to pass around the end of another large combe called Tenantry Ground (picture 9). Before long I was able to see along the length of the combe, which was half in shadow in the late afternoon sun (picture 10). The path continues across the rolling downland for about a kilometre to reach a wooden gate, where the path begins to gradually descend beside a large wheat field. At the bottom corner of the field, the path turns left through another gate and follows a worn path through trees and then beside horse paddocks to reach St Andrews Church on the edge of the village of Jevington (picture 11). From the church, Church Lane leads past a large stone house (picture 12) and out to the main road through the village. 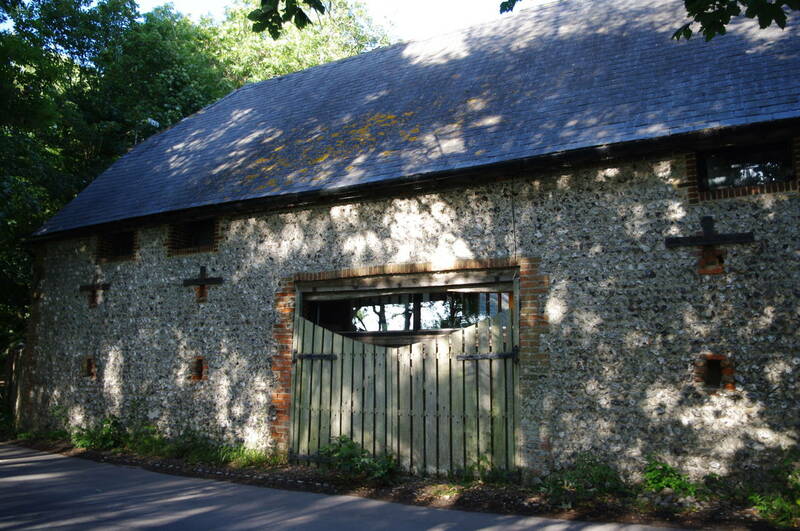 Turning right along the main road, I passed by Willingdon Lane (where the 1066 Country Walk links with the South Downs Way) and the Jevington Tea Garden and then took the next left turn along a narrow, tree-lined gravel track that climbs steadily up Bourne Hill. 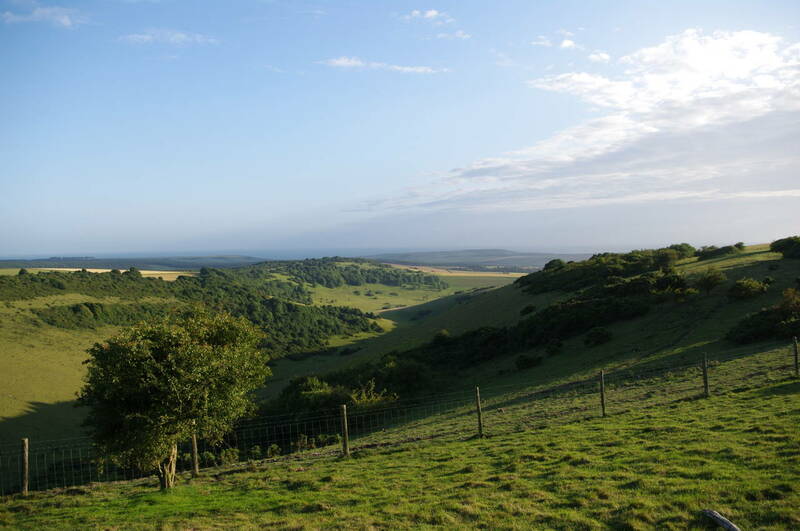 The trees soon give way to open downland as the path climbs higher (picture 13) and for a while there were good views back across the valley to Jevington and Windover Hill (picture 14). 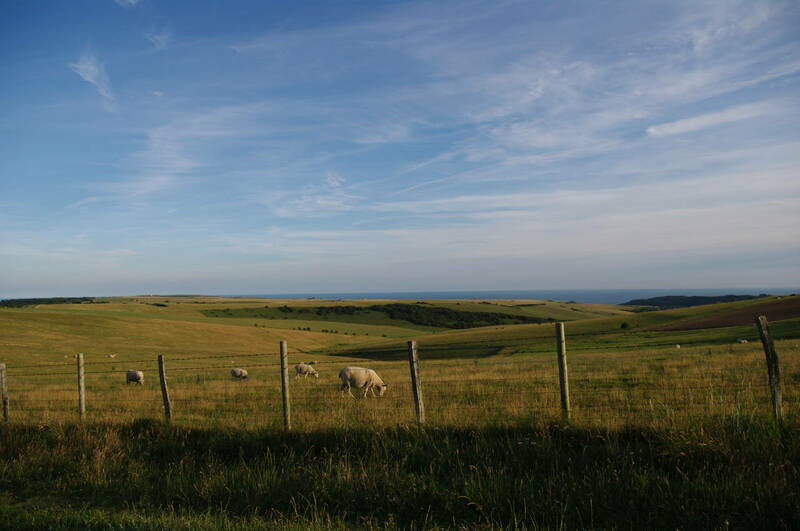 After about a kilometre, the South Downs Way crosses an intersection of paths and is joined by the Wealdway, soon reaching the crest of the hill, where the sprawling town of Eastbourne gradually comes into view on the left (picture 15), while sheep-grazed fields roll into the distance on the right (picture 16). 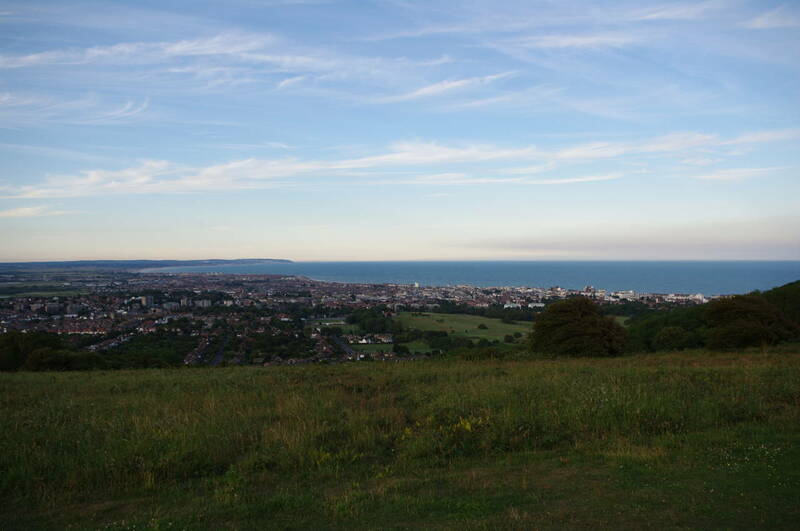 Before long the path passes through the Eastbourne Downs Golf Course, from which there were good views all the way across Pevensey Bay (picture 17). 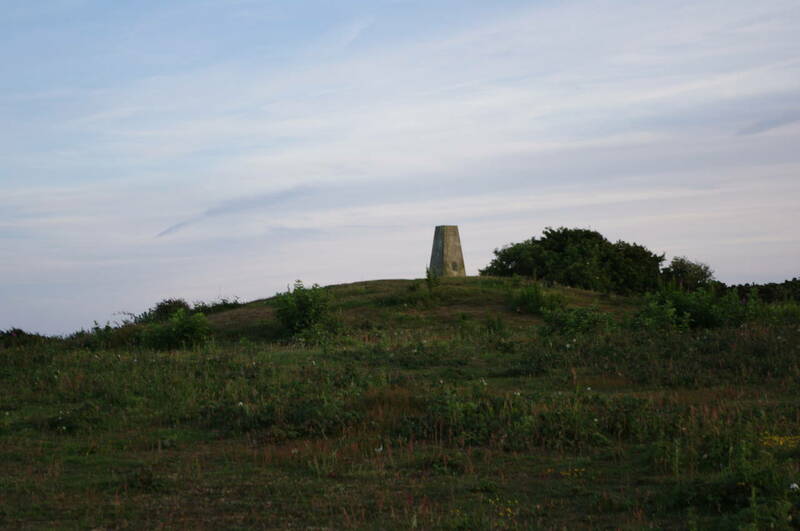 On the far side of the golf course, the path crosses over the A259 Eastbourne Road and follows another footpath away from the road, climbing a little to pass to the left of a trig point that stands atop a tumulus on the summit of Warren Hill (picture 18), while the Wealdway heads off past the other side of the trig point towards Beachy Head. 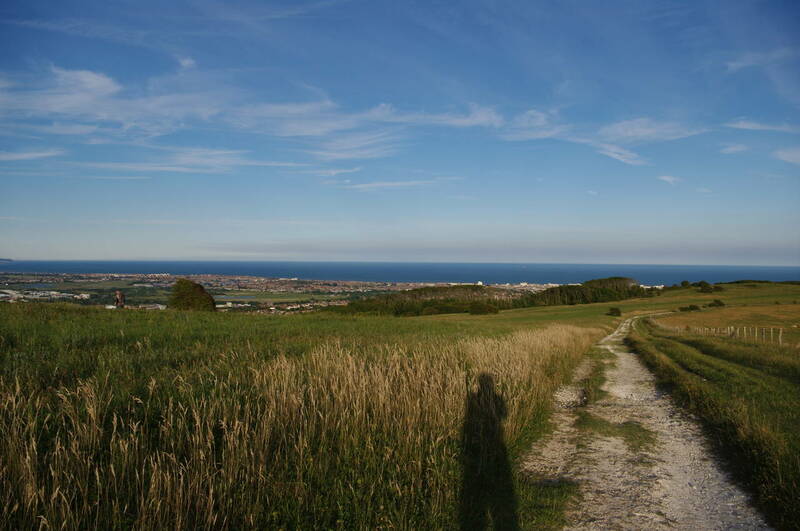 The South Downs Way now begins to descend between patches of woodland towards the edge of Eastbourne (picture 19). eventually reaching an information board which marks the end of the walk by Paradise Drive (picture 20). 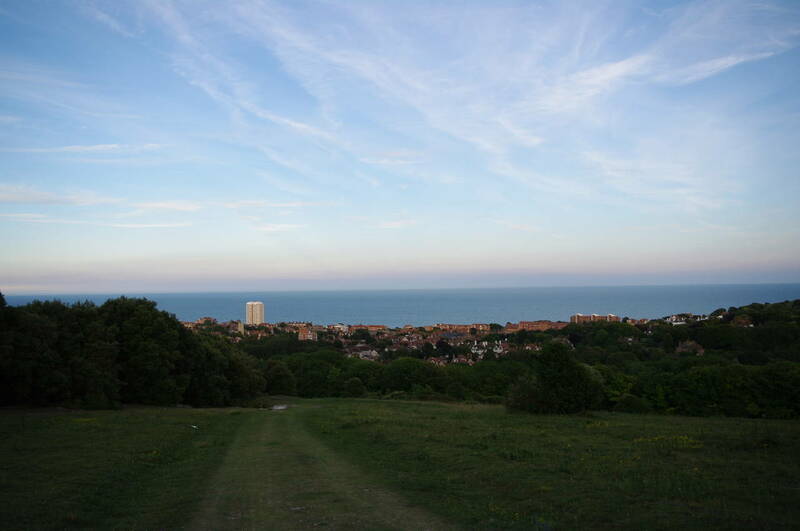 By now it was beginning to get dark and the last traces of daylight had disappeared by the time I had walked the two and a half kilometres from the end of the South Downs Way to Eastbourne Pier. 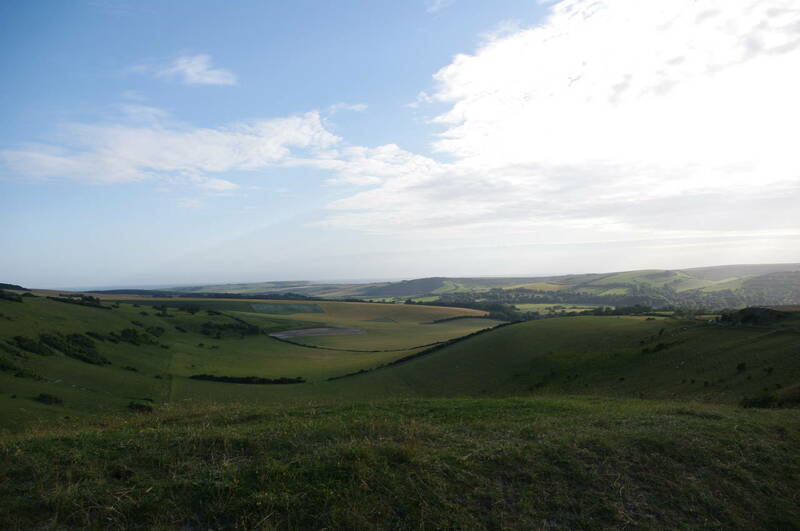 Including my detour to the Long Man of Wilmington and the walk into the middle of Eastbourne I had walked about 16 kilometres, 11.9km of that along the official route of the South Downs Way. Despite the climbs up Windover Hill and Bourne Hill, this had been quite an easy walk in the cool of the evening. The next stage, along the coastal path, was certainly going to be a little more physically testing.